The Missouri S&T community will welcome new and returning students during its ninth annual MinerRama. Hosted by the student involvement department, the event kicks off at 11 a.m. Friday, Aug. 24, at the Puck and runs until 2 p.m. The event brings together approximately 200 student organizations, campus programs and local non-profit organizations to showcase ways students can get involved. 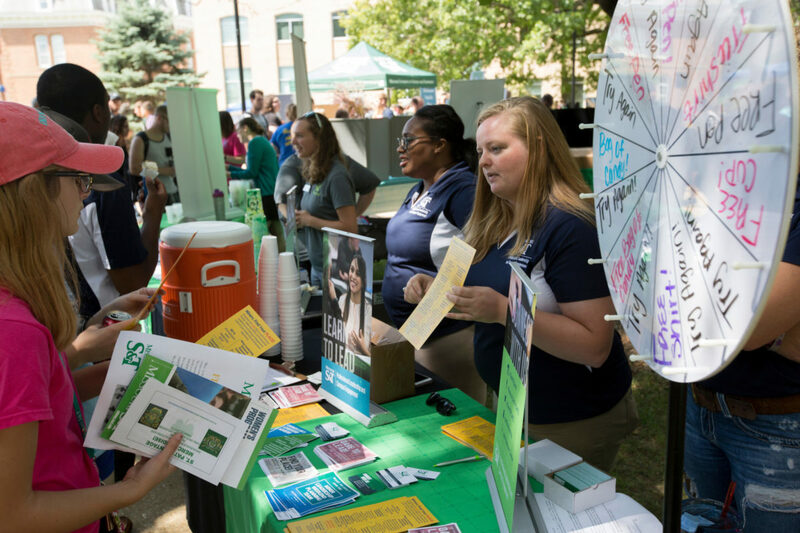 Attendees will visit tables, play games and receive giveaways, all while learning about things to do throughout the academic year and campus resources. Katlyn Maas, a senior in engineering management from Morrisville, Missouri, enjoys MinerRama and recommends attending — especially for new students. Dr. Christopher Maples, interim chancellor, and other S&T leaders will serve free ice cream treats to students, faculty and staff, from a tent near the Puck from 11:30 a.m. to 1:30 p.m. during MinerRama. In the event of rain, MinerRama will be moved into the Havener Center Atrium. For more information, please contact the event’s organizer, Jennifer Mueller, student service coordinator, at 341-7877 or email involvement@mst.edu.